Loaded with vitamin C, antioxidants, and tons of other beneficial nutrients, this tall glass of fruits and vegetables is a powerhouse of healing. Wash and chop all ingredients, run them through your juicer, and enjoy immediately! 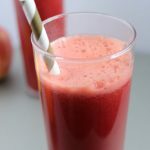 For this recipe, I highly recommend using a real juicer instead of a blender. Most blenders can’t handle beets and carrots. If using a Blendtec or a Vitamix, you can probably get the job done. The consistency will be much more pulpy than what you’d get from a juicer, but you can strain it out using a nut milk bag, cheesecloth, or a fine mesh strainer.